On this blue planet, long before dinosaurs prowled the continents, tiny green organisms populated the ancient oceans. Fossil and phylogenetic evidence suggests that chlorophyll, the green pigment responsible for colouring these organisms, has been in existence for roughly 3.8 billion years. Here, Joseph E. Armstrong traces the history of these verdant organisms, from their ancient beginnings to the diversity of green life that inhabits the Earth today. 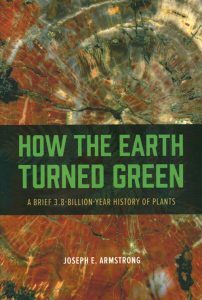 More engaging than a traditional textbook and displaying an astonishing breadth, How the Earth Turned Green will both delight and enlighten embryonic botanists and any student interested in the evolutionary history of plants. Plants in Mesozoic time: morphological innovations, phylogeny, ecosystems. Artist/Author: Gee, Carole T. et al. Showcases cutting-edge research of broad botanical and palaeontological interest from the world’s experts on Mesozoic plant life. 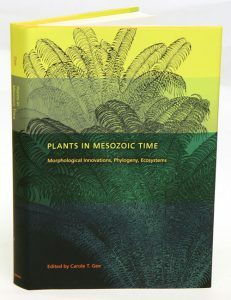 Each chapter covers a special aspect of a particular plant group – ranging from horsetails to ginkgophytes, from cycads to conifers – and relates it to key innovations in structure, phylogenetic relationships, Mesozoic vegetation, or to animals such as plant-eating dinosaurs. The book’s geographic scope ranges from Antarctica and Argentina to the western interior of North America, with studies on the reconstruction of the Late Jurassic vegetation of the Morrison Formation and on fossil conifers from Early Cretaceous deposits in Texas and Utah. 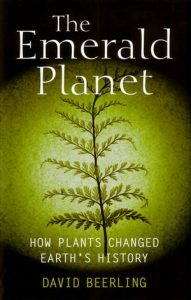 The emerald planet: how plants changed earth’s history. Plants have transformed our planet over the last 400 million years as they invaded the land and diversified into the astonishing variety we know today. But their influence has reached even further: they have profoundly moulded the Earth’s climate and the evolutionary trajectory of life. Far from being ‘silent witnesses to the passage of time’, plants are dynamic components of our world, shaping the environment throughout history as much as that environment has shaped them. In The Emerald Planet, David Beerling puts plants centre stage, revealing the crucial role they have played in driving global changes in the environment, in recording hidden facets of Earth’s history, and in helping us to predict its future. His account draws together evidence from fossil plants, from experiments with their living counterparts, and from computer models of the ‘Earth System’, to illuminate the history of our planet and its biodiversity.This new approach reveals how plummeting carbon dioxide levels removed a barrier to the evolution of the leaf; how plants played a starring role in pushing oxygen levels upwards, allowing spectacular giant insects to thrive in the Carboniferous; and it strengthens fascinating and contentious fossil evidence for an ancient hole in the ozone layer., Along the way, Beerling introduces a lively cast of pioneering scientists from Victorian times onwards whose discoveries provided the crucial background to these and the other puzzles. This new understanding of our planet’s past sheds a sobering light on our own climate-changing activities, and offers clues to what our climatic and ecological futures might look like. There could be no more important time to take a close look at plants, and to understand the history of the world through the stories they tell. Also available in hardcover [stock id 25849]. Readers join Silvertown as he explores the astonishing diversity of plant life in regions as spectacular as the verdant climes of Japan, the lush grounds of the Royal Botanical Gardens at Kew, the shallow wetlands and teeming freshwaters of Florida, the tropical rainforests of southeast Mexico, and the Canary Islands archipelago, whose evolutionary novelties – and exotic plant life – have earned it the sobriquet “the Galapagos of botany.” Along the way, Silvertown looks closely at the evolution of plant diversity in these locales and explains why such variety persists in light of ecological patterns and evolutionary processes. In novel and useful ways, he also investigates the current state of plant diversity on the planet to show the ever challenging threats posed by invasive species and humans. 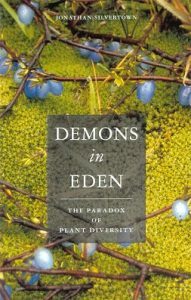 Bringing the secret life of plants into more colorful and vivid focus than ever before, Demons in Eden is an empathic and impassioned exploration of modern plant ecology that unlocks evolutionary mysteries of the natural world. Also available in paperback [stock id 12084]. Artist/Author: Willis, K.J. and J.C. McElwain. This title is not held in stock but we are happy to supply on special order. Please contact us.Plants first colonized the land over 430 million years ago, having evolved from some of the most primitive forms of life. Since then, plants have played a major role in supplying the atmospheric oxygen we all need to survive. But how did plants evolve, how has their distribution and diversity been affected by changes in climate over millions of years – and how can these processes be studied? This book blends evidence from the fossil record and data from biomolecular studies to tell the story of plant evolution from the earliest forms of life to the present day. Focusing on the key events during the evolution of plants – from the colonization of land to the first forests, the emergence of seed plants to the evolution of flowering plants – its straightforward explanations and clear illustrations provide the reader with the most accessible introduction to plant evolution available. With stunning biome maps illustrating the global distribution of plants during the different periods of life on Earth, the book explains how the diversity of vegetation has changed in response to climate, reinforcing the close link between climate change and the process of biological evolution. It is a contemporary account of a dynamic field, which is perfect for any student looking for a broad, balanced introduction to the subject.